Whether you're a tourist or traveling on business, Backpacker 16 Accommodation is a great choice for accommodation when visiting Dubai. Backpacker 16 Hostel is good for big groups, solo adventurers, business travelers and couples. Our hostel has a manager on due who can be contacted 24/7. 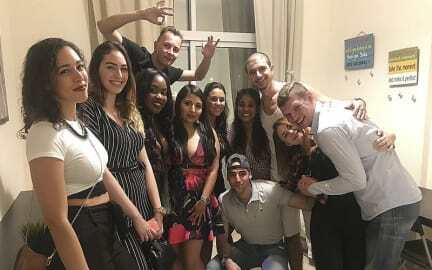 In our hostel you can get new acquaintances with guests from all over the world, and our friendly staff will do everything to make you feel like at home. Hundreds of people choose our place due to pleasant facilities, central location and attractive prices. Join us and make the most of your stay with Backpacker16! From here you can enjoy easy visiting the most popular places in Dubai. Our hostel is placed near Dubai Marina - one of the greatest area in the country. A lot of skyscrapers, big public beach, bay and yachts, plenty of restaurants, cafés and attractions - all of this only in 15 minutes from our hostel! Five minutes by walk to reach Dubai Internet City metro station (0.6 kilometers/ 0,37 miles). Also, our hostel is close to artificial Palm Island, Burj Khalifa (the highest building in the world) and safari pick up location. We offer a range of dormitories, from mixed to male and also female and double rooms of different sizes with shared bathroom facilities. You can spend time in our common sitting room. In the hostel we provide hairdryer, iron, ironing board, microwave oven, toaster, extensions! Chargeable late check-out /early check-in. Refundable deposit 50 aed (15 USD approx.) for the set of keys and towel. Alcohol is forbidden in the whole hostel. I was hesitant about staying at a hostel, I originally booked a hotel but I am glad I chose to stay at a hostel. This one specially, it was great. Everyone was friendly specially one of the workers his name was jean, we all went out and he joined us. He was very helpful and very kind. I will definitely stay here again when I go back. ola is a super receptionist very friendly and helpful the guys that clean and make breakfast are very friendly and hardworking to. Very clean hostel and comfortable. I would definitely recommend it to everyone . The place is perfect for anybody who looks for a convenient place and a friendly atmosphere. It’s comfortable, cozy, and the staff is very helpful. It was really great. It isn't in the center but that's was great for me! I really enjoyed staying here the staff are lovely and very informative. The rooms are a good size with a power plug are light and the shelf at every bed along with a curtain for each bed. They also provide a Locker in your room with a key so you don't need a padlock. The bathrooms are big and clean but there is only 3. The hostel is only about a 10 minute walk with a bag from internet city station. The hostel is good value and I would recommend staying here. I always come back to this place because its really good. Good staff good atmosphere and most importantly Cleaaaan! Thank you guys for the great time. This hostel in a far place in the Dubai internet city from the main Metro station, so you have to walk for about half an hour to get there the facility is very dirty and crowded also the staff is not enough they have a breakfast for 15 dirham but you can get a better deal some where else. the place is not clean as it should be so at your own risk. They’re infested with bedbugs. Please avoid this at all cost.